A State Historic Monument, the Hearst Castle in California features two swimming pools, stunning expanses of gardens, and a 115 room house. 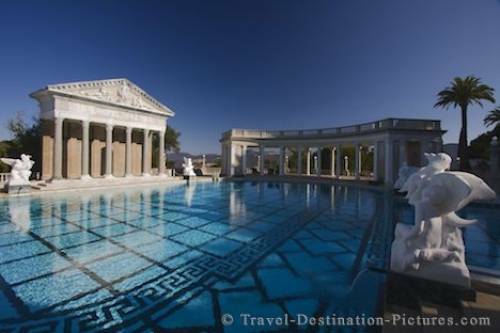 The impressive outdoor pool of Hearst castle is built like a roman temple. William Randolph Hearst resided here in the early 1900s, inviting lots of stars, managers and politicians. Hearst Castle in California, USA.